I have belonged to the SF Book Club for close to thirty years now and through them have read some of my favorite books - Downbelow Station; the first 5 Chronicles of Amber, aka "the good ones" (IMO); Butterfly and Hellflower; the original Conan stories; The Swordswoman and Consider Phlebas, among others. Most of them were "risks" - I didn't know the authors at the time and was relying on the blurb and just possibly the cover art. 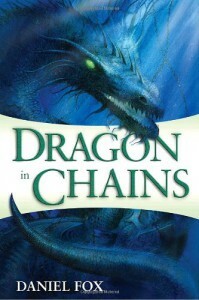 Dragon in Chains is another one of those risks. I knew (and still know little) about the author, Daniel Fox, but I enjoyed this book. The story is set in an Asian-themed world where the author does little to disguise it from a Chinese Empire with magical elements. The dragon of the title is a powerful force of nature/magic that was bound long ago and chained to the floor of the sea (in the straits between the mainland and the island of Taishu). A group of monks has spent the last few centuries maintaining that chain but when they're butchered by a pirate that guardianship ends and the chain is tenuously maintained by a smith, the lone survivor of the temple, and a slave boy. In the meantime, the Son of Heaven has fled to the island of Taishu, fleeing rebel armies, and the jade miners of Taishu have sent one of their own directly to the emperor with an astonishing find. One of the fantastical elements that Fox injects into his world is the remarkable properties of jade. Unlike our jade, the jade of this world is reserved solely for the emperor as it conveys superhuman strength and longevity to those who possess it. Fox does a good job of drawing the three threads together by the end of the book and I am curious to find out what happens next. Overall, this was a pleasant diversion, fast paced and interesting enough to keep this reader hooked.